It was generally held knowledge among the people who lived on Withward Street that the eldest of the three Miss Lockwells had a peculiar habit of reading while walking. So often was she observed engaged in this activity that, while the practice was unusual – and therefore not altogether admirable – people had become accustomed to it. On almost any fine day she might be seen striding past the brick houses that stood along the streets as upright as magistrates, a volume in her band and her attention absorbed by the pages before her. No one bothered to wave or call out in greeting as she passed; they had learned long ago there was no point in it when she had a book with her. First of all, how great an opening is that? The Magicians and Mrs. Quent is a fantasy of manners set in a secondary world by the name of Altania. It tells the story of three characters: Ivy Lockwell, the bookworm of the passage above, has an interest in magic but as a woman is barred from its practice. The Lockwells have been in difficult circumstances since Mr Lockwell became disabled in a mysterious incident, and as a result Ivy accepts a job working for the elusive Mr Quent. The other two point of view characters are Dashton Rafferdy, a young man from a higher social sphere who becomes close to the Lockwells, particularly Ivy; and Eldyn Garritt, an old friend of Rafferdy’s, who against his will becomes involved with dangerous men and must change his life for his sake as well as for the sake of his sister. Before I answer the question, I should explain how the book is structured. 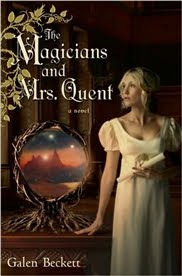 The Magicians and Mrs. Quent is divided into three parts: the first, set in the city of Invarel, pays tribute to Pride and Prejudice in tone and plot. The second is told in epistolary format and has strong echoes of Jane Eyre, Rebecca, and The Turn of the Screw. Finally, part three brings all the plot strands together in a surprisingly Lovecraftian climax. Galen Beckett (aka Mark Anthony1) has said that part of the reason why he wrote this book was to answer the question, “what if there was a fantastical cause underlying the social constraints and limited choices confronting a heroine in a novel by Jane Austen or Charlotte Brontë?” — which I think is a very interesting premise. He doesn’t handle it as well as Jo Walton does in Tooth and Claw, but then again not everybody can be Jo Walton. To answer Trisha’s question, then, I don’t think The Magicians and Mrs. Quent is on the wrong side of the line dividing tribute from unoriginality, though some elements worked better than others. I quite enjoyed playing the I-know-how-this-story-goes game as I was reading. I suspect that rather than being lazy or easy, well done intertextuality and what I think of as skilled predictability actually take a lot of work. How do you make a story both familiar and new? This is one of the reasons why I love fairy tale retellings: I love stories that evoke other stories while still being their own thing; stories whose shape we can anticipate but don’t enjoy any less for that – quite the contrary. At its best, The Magicians of Mrs. Quent does exactly that, especially in part two. Strange though this might sound, knowing the shape of the story in front of me was part of what kept me turning the pages. I needed to know which bits I was right about and which bits were going to surprise me. However, I’m not sure if the Lovecraftian turn of events in section three worked quite as well. I don’t want to give everything away, but when the Ashen were introduced into the story I couldn’t help but start singing Awake Ye Scary Great Old One in my head, and I kind of kept doing it all through the rest of the book. The thing is, I actually like the psychological reality this kind of story expresses – that’s why I’m a Lovecraft fan despite his somewhat preposterous writing. I like how well they capture the feeling of insignificance many people experience when facing the scope of the universe and the infinity of time. The Magicians and Mrs. Quent captures that well, but the Ashen were too much like creatures from the Dungeon Dimension minus the humour of Discworld. Something about the tone reminded me of a parody gone wrong, which I’m pretty sure is not what was supposed to happen. Perhaps the problem was the fact that the tone of the first two sections felt so at odds with this one, which prevented me from taking it seriously. However, I’m sure many other readers will feel differently. You need to be patient in part one, as the build-up is slow. There’s a lot of jumping around between characters at first, and it takes a while for the seemingly unconnected plot strands to come together. But once the story picks up I was very much hooked, so I would say the initial investment is worth it. The first 150 pages or so are slow going, but the rest flies by. As you can probably tell by now, I enjoyed The Magicians and Mrs. Quent for the most part; but if there was one thing that kept me from being completely satisfied, it was the fact that the characterisation was a little bit thin around the edges when it came to anyone but the three main characters. Eldyn’s sister Sashie was like Nora from A Doll’s House minus the ending. Her brother sees her, treats her, and portrays her to the reader as a doll. I kept waiting for the moment when we’d see her as a real human being, but sadly it never came. However, this is the first book in a series, so I should probably reserve judgement. Ivy’s sisters Rose and Lily also seemed pretty one-dimensional to me. Rose in particular had me rolling my eyes with alarming frequency, as she comes across as a cartoonish mystic – ‘simple’ but attuned to Hidden Powers. But like I said, the characterisation is fine when it comes to the three protagonists, and that was enough to keep this character-oriented reader mostly happy. I didn’t love The Magicians and Mrs. Quent as much as Memory, Shanra or Meghan did, even though I agree with them 99% of the time, but obviously that doesn’t mean others won’t. I did think it was a fun read and I want to know what happens next, so I’ll eventually be getting my hands on The House on Durrow Street. 1If anyone has any idea about the marketing reasons behind Anthony’s female pseudonym and the pretence that this is a debut novel, I would love to hear them. I've had this on my wishlist for ages and have been really curious about it. So it's lovely to read your review. And I love the way you decribe the third part as 'a surprisingly Lovecraftian climax'. I definitely have to read it now. I thought everyone loved this book but me! I liked it well enough but it felt flat, the characters were slightly boring, and while I loved the world and the Austen influences, it never came together for me. I felt almost as if three books were mashed together. I did read The House on Durrow Street too and felt pretty much the same way about it. Sadly, I really want to love these books but I just sort of like them. Well, you've certainly aroused my curiosity! I'm adding this one to my list. First off, this sounds really kind of cool! I think it's easy enough to pay homage to one novel, but by blending in several others, the resulting novel is likely to be more complex than if it had just focused on one. Obviously not all of the books and genres from which this one borrows were equally at home in the final product, but it does sound like it made for a fun read. I really enjoyed that opening you supplied, because it immediately set a very strong scene in my mind and made me want to know more about this eldest of the three Lockwells! The only thing I wish is that this book had a better cover! The one you have posted looks super cheeseballs, and if I were in a store browsing, I am sure I would pass this book by without a second thought! I'm glad I took the time to read your review, however, because the stuff between the covers actually sounds quite good! This book sounds, to be blunt, like it would be an AMAZEBALLS follow-up/tag-a-long with some of the other magic-y books I've been reading lately (while also letting me get that fill of Rebecca I look forward to so much at this time of year!) If A Discovery of Witches and Jonathan Strange and Mr. Norell didn't satisfy my craving for historical magic, this one just might! The three different parts had my interest piqued. Then you went and mentioned epistolary and you know how I love books like that! I hadn't heard of this book before, but am not sure if it's for me. Something about the way the plots are melded makes me a little guarded about this book, and the fact that the characters are a little underdeveloped doesn't help, I'm afraid. I did enjoy reading your perceptions on it though, and would be interested in reading some other reviews of it, so I will have to check out some of your links. Thanks, Ana! Despite some of your reservations, this plot really appeals to me. I would have to agree with Steph, though, that the cover could use some spiffing up. I would walk right on by that book if I saw it in the wild. Oh, I'm actually glad you felt that way about this book! I have had the opportunity to buy it at a few used bookstores, but kept quavering and ultimately never did so because if there is ANY book that has the potential to sorely disappoint me, it's fantasy fiction set in Regency England. So, I'm glad I took a pass on this one, though I adore the cover. And the fact that it's written by a man. As for why the pseudonym, I actually think it's probably the mirror of the reason JK Rowling took a more gender-neutral pen name. And probably similar to the reason that Jude Morgan (and Hannah March) is a pen name for Tom Wilson. This sounds like a book I could go either way on. The premise does sound interesting, but if the characterizations are a little thin, I don't know that I'll have the patience to let it play out. We'll see! I like the idea of each part playing off a different classic novel. I didn't love this book either, and in fact I think I liked it slightly less than you. I wasn't wild about Tooth and Claw either (alas!) -- I think maybe a fantastical cause underlying social constraints is not for me. Or else people are just doing it wrong. And I so want them to do it right! I've seen some mixed opinions on this one. I'm still on the fence about whether I'll add it to my list. I'm wondering if I'd be bothered by the weak development of the secondary characters. Although you didn't love it, I'm really glad you did like it so much, and agreed that it was on the right side of homage / imitation. I can't really remember what I else I thought about it, but I do think the middle section was my favourite as well. I still haven't managed to read the sequel, but you've reminded me that I really should. For the record, Galen is a guy's name, though it took me a little while to realize it as I had it all tangled up with Gaelen (which is a female name) inside my head. I'm not sure whether Galen and Gaelen are the male and female versions of the same name or completely separate names that just happen to look alike. Anyways, I think he used the pseudonym because his other books are quite different in tone. I have yet to read any of them, but they seem very much in the medievalesque fantasy mode. I think "Galen" it is ambisexual. The only Galen I've ever known was a woman born in the 1940's or early 1950's, who like Mark Anthony (when your name is Mark Anthony, how can you possibly require a pseudonym?! ), chose it for herself as a young woman. Actually, I did not know the book was by a man, and that is very interesting, and I am tempted to retroactively draw certain things from the knowledge (a new light shed on beard fixations), but will not. I'm so glad you reviewed this, and you have convinced me you are a saint of evenhandedness. I am more with Jenny's Books Jenny and Amy. Or if there were someone who was extremely frustrated with this book, I would be with them. And if they were subsequently so frustrated with and bored by the House on Durrow Street they quit it half way through, I would be with them even more, because that is what I did. Mainly, I think I made a big, big mistake reading these books anywhere near Jude Morgan's. And I think sometimes authors just write books because they enjoy living in the worlds they make while they're writing them, and think up reasons after. You know, if I had known it was going to take you so long to actually review this book, I would have still been able to review it with you... :p That being said,I really liked the opening of this book, but I never really got into it. Obviously, or I would have read it by now... One day I will get around to it! This is one I have on the to-read list, but that list is so freaking long now that I've no clue when I'll finally get to it. Sakura: I'll be very curious to know what you make of the Lovecraftian elements! Amy: By the sound of it I liked it a little bit more than you did, but I still can relate to how you feel. Sorry to hear the sequel wasn't any better for you! Chelsea: This does have a very Jonathan Strange and Mr. Norell-ish vibe. Personally I much prefered that, but I'm sure plenty of other readers will like this better. Zibilee: Yes, do read some of the other reviews! A lot of people really loved it so I don't want to put anyone off reading it. Sandy: I know what you mean. I think I'm a bit more used to fantasy covers than you and Steph, but there are MUCH better ones out there. Aarti: The setting is more like its own thing than a clear evocation of Regency England, so maybe that wouldn't be much of a problem for you. On the other hand, the Austenesque elements are very clearly there. I actually love that it's written by a man too - the same with Jude Morgan's book! But I'd love to know more about the thought process behind it. Heidenkind: Yep, it was :P Don't trust me completely on the characterisation, as a lot of people felt differently. I look forward to hearing what you think about it! Jenny: I didn't remember that about Tooth and Claw! For some reason in my head it was a Jenny book :P Hopefully one day someone will execute this kind of premise so well it will blow you away. Meghan: I did have lots of fun with it. Hopefully we'll both enjoy the sequel! Trapunto: Ha, I know! Why would anyone change a name as awesome as that? ;) I'm sorry to hear the second book frustrated you so much. I can see what you mean about him loving the world he had created. I think some of that feeling ended up rubbing off on me, and that made me enjoy the book more. In any case, I wouldn't recommend reading the books after Morgan's either! Trisha: I know how that is. I'm not sure when I'll get to the sequel either! Regarding name changes and tucking an author's backlist away: it's often purely a way of keeping someone's career going, with the potentially confusing shift aimed not at general readers but at the buyers who choose what will go on bookstore shelves. If, say, Barbara Shinberg's last book didn't sell very well, store buyers are unlikely to order copies of her next book; therefore, her editor and agent might advise her to begin publishing as Hailey Oppenheim instead. The hypothetical bookstore buyer is more likely to order copies of Hailey Oppenheim's seemingly debut novel because it comes with a clean slate, whereas they already (think they) know how Barbara Shinberg's new title will sell. I made those names up, but this has happened to many, many authors over the years. My favourite author, Sarah Monette, will publish future novels as Katherine Addison because her first four didn't sell well. (Which breaks my heart, since they're my favouritest books ever and I want the whole world to read them. Wah!) In her case, she did quite a bit to get the word out; I saw the name change news on many different blogs, along with the reasoning behind it. I'd hope other authors in a similar position would do the same so existing fans can follow them to their name and new fans can seek out their older work. Even in the sequel, which I think improved on this one in a number of ways (mostly in terms of the cohesiveness of the various plot threads), the characterization on some of the minor characters was still pretty thin. I love the main characters well enough, though, that I didn't mind, and I'm absolutely looking forward to the third book this spring. I'm glad you liked this, even if you didn't love it, and hope you continue on with the series. Memory: No, don't be sorry! You didn't sound like that; I just worry too much :P And thank you so much for explaining that. It makes sense now from a business perspeective, though it's still sad that authors may have to risk fans losing track of them in the process. I'm glad Sarah Monette was able to spread the word successfully. And this reminds me that I really need to read her stuff. Fyrefly: Although I'm sad to hear that about the secondary characters, I think it will do me good to be prepared! There was definitely enough here to enjoy to make me want to continue with the series.